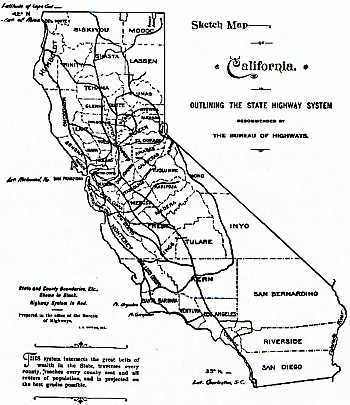 The first roads in California were horse trails and wagon roads, developed by people coming to California. After statehood was granted in 1850, Californians began to pressure for improved roads. As a result, in 1850, the state created the Office of Surveyor General, with the duty to suggest roads. In 1855, there was public demand for a road from the Sacramento Valley to Carson Valley in Nevada, and the legislature passed a bill ordering the Surveyor General to survey a good wagon road over the Sierra Nevada Mountains, and authorized bids for construction of the Emigrant Wagon Road (one record actually shows this bill passing in April 1850). The bill authorized costs up to $105,000, but the legislature neglected to actually appropriate the funds. Instead, a policy of granting franchises for building toll roads evolved, resulting in a number of toll roads and bridges being constructed between 1850 and 1880. One of this was the authorized "Emigrant Wagon Road", also called the "Lake Tahoe Wagon Road", which was completed in November 1858. In 1864, the railroads (CP) completed the Dutch Flat and Donner Lake Wagon Road over the Sierra. This was also a toll facility. The original proposal argued that the state should construct the routes, as the counties were too cash-strapped to construct and maintain the roads on their own. However, this was modified by the legislature, which feared the increasing power of the state capitol. They inserted provisions that permitted the counties greater control over the system, including the ability to add an unlimited amount of new routes. "An act to authorize the state of California to secure the title to and right of way for that certain wagon-road...commencing a short distance easterly from the village of Smith's Flat...and running thence to Lake Tahoe..."
LRN 11 US 50 US 50 Define Placerville to Lake Tahoe: "[authorization to secure the title and right of way of] that certain wagon road situated and being in the county of El Dorado ... commencing at the junction of the Lake Tahoe Wagon Road with the wagon road leading from Placerville to the town of Newtown, a short distance E-ly from the village of Smith's Flat ... and running thence from the junction of said roads to Lake Tahoe." 1897. “An act to create the office of Lake Tahoe Wagon Road Commissioner...”. 1905. “An act to provide for the construction of permanent bridge work on the Lake Tahoe wagon road, a state highway...”. "An act to appropriate money for the survey, location, construction of a free wagon road from the town of Mariposa in Mariposa County to the Yosemite Valley"
LRN 18 CA 140 CA 140 Survey Only "...a free wagon road from the town of Mariposa in Mariposa County to the Yosemite Valley..."
Funding for this was transferred to the General Grant-Kings Cyn Road in 1905, but the route was included in the 1909 bond act. In 1897, the Legislature dissolved the Bureau of Highways, and established the Department of Highways, consisting of three commissioners appointed for two year terms, and a civil engineer appointed for a four year term. It was at this time that the state took over the toll road, then known as the Lake Tahoe Toll Road. This is the route of present-day US 50. However, the recommendations made by the new Department were often ignored, because of the fear of central state power by the legislators. "An act to provide for the construction of a state highway or wagon road from Sacramento City to Folsom..."
"A public highway or wagon road shall be built from a point on the E limits of the city of Sacramento, to Folsom in Sacramento Cty as near as practicable along the route of the present most direct line of county roads between these two points..."
"An act to provide for the construction of a free wagon road from the Mono lake basin to connect with a road called 'Tioga road,' at or near the 'Tioga mine,' and making an appropriation therefor." "...for the purpose of locating and constructing a free wagon road from the Mono Lake Basin to and connecting with a wagon road called the "Tioga Road" and near the "Tioga Mine"..."
"An act to declare a part of the Sonora and Mono wagon road, commencing east of Sonora, at a point known as Long Barn...and running thence across the summit of the Sierra Nevada Mountains to Bridgeport...a state highway." "That portion of the Sonora and Mono wagon road, commencing E of Sonora and at a point commonly known as Long Barn in Tuolumne Cty and running thence across the summit of the Sierra Nevada mountains to Bridgeport in Mono County is hereby declared a state highway." 1905. "An act...for the purpose of erecting and constructing bridges, culverts, and grading upon the Sonora and Mono road, a state highway." Note that this may also have affected LRN 23. In 1902, the state constitution was amended to give the Legislature the power to establish a system of state highways, and to pass the laws necessary for highway construction. It also permitted state aid to be provided to counties for road construction. "An act to provide for locating and surveying a proposed highway from a point on the Trinity River...near the town of North Fork, thence westerly down said river about forty miles to connect with an existing road in Humboldt county..."
LRN 20 CA 44 US 299 Unknown Survey Only "for the purposes of locating and surveying a proposed highway from a point on the Trinity River near the town of North Fork, thences W-ly down said river to connect with an existing road in Humboldt County." "An act to provide for the location and construction of a public highway from the General Grant Park...to the Kings River canyon...and providing for a commission to take charge of, locate and construct said highway..."
"...for the purpose of locating, surveying, and constructing a public highway from the General Grant National Park in Fresno County, thence E-ly into Kings Canyon..."
1909. "An act to provide for the continuation of the construction of the highway known as King's river highway, to declare it a state highway..."
In 1907, the Legislature created the Department of Engineering, the forerunner of the Department of Public Works. The Department of Highways and Lake Tahoe Wagon Road Commission were placed under the control of the department. Highway funding was provided by the Legislature through "Special Appropriations". This was at a minimum funding level, and most funds were devoted to maintenance, such as clearing storm debris and the construction of retaining walls and culverts. "An act to make an appropriation for the location, survey and construction of a state highway from a point known as the Mount Pleasant ranch on the road between Quincy and Marysville thence in a southeasterly direction by Eureka to Downieville, Sierra County." LRN 36 Unknown CA 194 Define Mt. Pleasant Ranch to Downieville. Not currently in the state highway system. "...for the location, survey, and construction of a state highway from a point known as the Mt. Pleasant Ranch on the road between Quincy and Marysville thence in a SE-ly direction by a place called Eureka to Downieville, Sierra Cty..."
"An act to provide for the survey, location and construction of a state highway connecting the present county road systems of any one or all of the counties of Trinity, Tehama and Shasta with the road system of Humboldt County..."
"...for the purpose of locating, surveying, and constructing a state highway connecting the present county road systems of any one or all of the counties of Trinity, Tehama, and Shasta with the road system of Humboldt County..."
1911. “An act...for the construction and completion of a state highway connecting the counties of Trinity, Tehama and Shasta with the road system of Humboldt county.”. 1913. “An act to make an appropriation for maintenance of the Trinity-Humboldt state road.”. "An act to make an appropriation for the location, survey and construction of a state highway from Emigrant Gap...to the west end of Donner Lake..."
...for the location, survey, and construction of a state highway from Emigrant Gap, Placer County in an E-ly direction through what is known as the Truckee Pass to the W end of Donner Lake in Nevada County... and it shall be the duty of the department to locate, survey, and construct said road along the line of the wagon road known as the Dutch Flat and Donner Lake wagon road..."
In 1909, the Legislature authorized the first State Highway Bond Act, for $18,000,000 (approved by the voters in 1910). This act established a State Highway system and authorized construction of 3,052 mi of highways.It required that the Department of Engineering acquire the necessary land, and construct a continuous and connected highway system. The funding allowed a significant quantity of highways to start construction. For example, with funds from the State Highway Bond Act of 1909, construction began on California State Highway Contract No. 1: paving a segment of El Camino Real in Burlingame and South San Francisco, San Mateo County. The highway was eventually designated US 101. Note: The definitions of the bond routes can be found here. 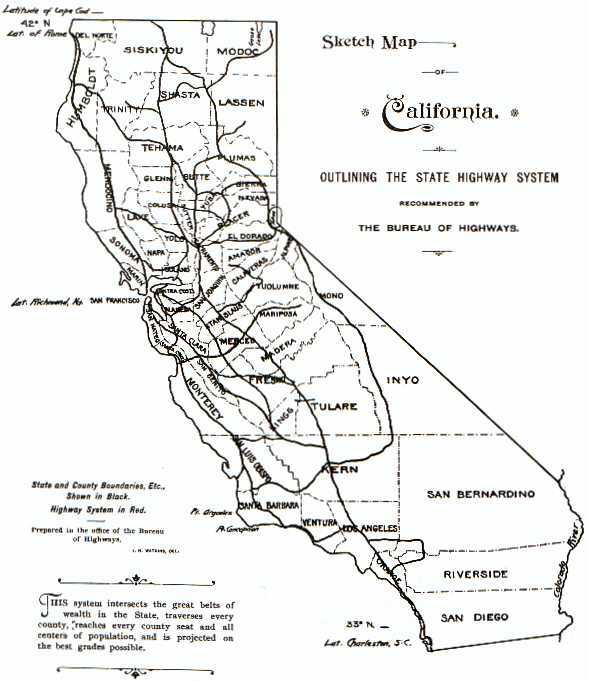 "The route or routes of said state highways shall be selected by the department of engineering and said route shall be selected and said highways so laid out and constructed or acquired as to constitute a continuous and connected state highway system running north and south through the state traversing the Sacramento and San Joaquin valleys and along the Pacific Coast by the most direct and practicable routes, connecting the county seats of the several counties through which it passes and joining the centers of population, together with such branch roads as may be necessary to connect therewith the several county seats lying east and west of said state highway." CA 21 I-680 Define US 101 in San Jose and Route 262/I-680 junction near Warm Springs. This was originally planned as part of Route 17. CA 140 CA 140 Define Route 99 near Merced to Mariposa. Unknown CA 36 Define Red Bluff to Susanville. US 40A CA 70 Define Oroville to Quincy. This route was abandoned as a distinct route, and LRN 21 extended to cover approximately the same milage. It was clear that the lowest numbers -- the first to be defined -- connected specific cities, places, or points of interest deemed to be of statewide importance -- LRN 1 and LRN 2 essentially defined US 101 (with some local deviations such as the northernmost segment of LRN 1 along US 199 rather than US 101) from the Mexican border to Oregon, and LRN 3 and LRN 4 covering US 99 (and US 99E) from Oregon south to Los Angeles. The next batch of numbers were connectors from these north-south "spines" to other points, sometimes in two directions; LRN 5 - LRN 8 were scattered over Northern California, connecting to one or more of the "spines". LRN 9 was more or less a rather strange "branch" from LRN 2 in Ventura, extending east along the northern reaches of the Los Angeles basin to San Bernardino, while LRN 10 crossed east-west on what is now Route 198. LRN 11 extended two ways from Sacramento (SW and east along US 50), LRN 12 connected LRN 2 in San Diego with Imperial Valley via US 80, LRN 13 connected LRN 4 at Salida, north of Modesto, with the eastern Sierra slope (on what is now Route 219 and Route 108). LRN 14 was a Bay Area connector from Oakland to Martinez (at the time, the US 40 Carquinez Bridge was privately owned and not part of the LRN network, so US 40 was discontinuous: LRN 14 south of the bridge and LRN 7 northward). LRN 15 connected LRN 1 and LRN 3 via Route 20, while LRN 16 was Route 175 from Hopland to Kelseyville, on Clear Lake (this must have been politically-motivated, as it partially duplicates LRN 15, only 20 miles to the north). LRN 17 connected LRN 3 at Roseville to Grass Valley, while LRN 18 was the "all-weather" Yosemite connection (Route 140) from LRN 4 at Merced. LRN 19 connected LRN 2 at Fullerton to the "Inland Empire" cities of Pomona and Riverside, while LRN 20 was a cross-state connector, originally Route 44 for its full length but later US 299 (Route 299) west of Redding. LRN 21 and above didn't follow the pattern of the first twenty as "branches" extending out from the spines, but were established in order statewide as roads were brought into the state system. In 1911, the Legislature passed the Chandler Act, which authorized the appointment of a three member board to advise the Department of Engineering. This board was to become the first Highway Commission. It also created the position of State Highway Engineer, serving at the pleasure of the Governor. The first State Highway Engineer was Austin B. Fletcher. Mr. Fletcher and the highway commissioners took a 6,800 mi tour of the state highways in 1911, and as a result of the recommendations from that tour, adopted the state highway system. Mr. Fletcher also recommended dividing the state into seven divisions (now "districts"), each in charge of an experience engineer. The Highway Commission also recommended that road be "permanent in character" and provide a "continuous and connected state highway system". "An act to provide a state highway from Meyer's station...to McKinney's..."
"...a state highway from a point on the Lake Tahoe state wagon road, at or near Myers Station... thence past Tallac, Emerald Bay, to McKinney's in Placer County...."
"An act to establish the Alpine state highway; to define its course..."
"The certain road commencing at the Calaveras big tree grove located in Calaveras County thence running to Dorrington in said county, thence E-ly following what is known as the Big Tree and Carson Valley Turnpike to Mt. Bullion in Alpine Cty, thence along county road to Markleeville in Alpine Cty, thence along that certain road via Kirkwood, Silver Lake, Pine Grove and Irishtown to Jackson in Amador Cty, including therewith the road from Picketts in Hope Valley connecting with the Lake Tahoe Wagon Road, a state highway, at Osgood's Place in El Dorado Cty, and the road from Mt Bullion via Loupe in Alpine Cty to Junction in Mono County connecting with the Sonora and Mono State Highway is hereby declared and established a state highway and shall be designated and known as "Alpine State Highway""
"An act declaring a state highway from the Shasta county line through Lassen county to the Modoc county line..."
LRN 28 CA 41 US 299 US 299 Reauthorize This was actually funded in the 1909 bond act. "That certain highway known as the county road and beginning on the boundary line between Shasta and Lassen Counties in the NE corner of T37N R6E and running and extending through T38N R6E, T38N R7E, T38N R8E, to the Modoc County Line...shall be designated and known as the Lassen State Highway"
On August 7, 1912, Commission Chairman Burton Towne turned the first shovel of dirt on State Highway Contract No. 1, for a section of the coast route between South San Francisco and Burlingame. However, this was not the first ground breaking for a new state highway, which had occurred a month earlier 3 mi N of Wheatland for what would become US 99E. "An act to provide for the survey and construction of a state highway from Saratoga Gap, on the line between the counties of Santa Clara and Santa Cruz, to, into and within California Redwood Park..."
"for the survey and construction of a state highway from the point known as Saratoga Gap on the line between the counties of Santa Clara and Santa Cruz, extending thence by the practicable route in a generally SW-ly direction along the ridge between the San Lorenzo and Pescadero creeks to the present boundary of the California State Redwoods Park, thence into the California State Redwoods Park in Santa Cruz County to Governor's Camp, and thence through said park to the boundary thereof at Bloom's Mill." "An act declaring and establishing a state highway from the city of Bakersfield through a portion of the counties of Kern, San Luis Obispo, Santa Barbara and Ventura to the city of San Buenaventura, designated and known as the Bakersfield, Maricopa and Ventura state highway." Route 119 Survey Only "A certain highway now partly constructed and partly in the course of construction by the several counties through which the same passes and running substantially along the following lines, courses, and distances: Commencing at a point on the proposed California state highway between Bakersfield and Los Angeles [LRN 4] thence following the present county road W 6 mi, then S 12 mi, thence W ½ mi, thence S ¾ mi, thence W 8 mi, thence SW 4 mi, thence W 5 mi to the town limits of the city of Maricopa, thence ... SW 13 miles to the W boundary of Kern County..., thence from a junction at the Kern Cty line with the proposed road as surveyed by Buffington ... for a distance of approx. 5 mi in the county of San Luis Obispo W about 1 mi through the lands of the Kern Cty Land Company and Cuyama Ranch, thence SW-ly 1½ mi, thence E-ly ¾ mi, thence SE-ly about 1 mi through the lands of the Santa Barbara Forest Reserve and of S.B. Miller, said line of proposed road ... following along the E-ly side of the Cuyama River and in the valley of said Cuyama river to the S border of SLO Cty. Thence from a junction point ... being in Sec. 11 T9N R25W SBM and running in a generally SE-ly direction, following the valley of the Cuyama river for a distance of 8.1 mi to a point in the E boundary of Santa Barbara Cty in Sec 17 T8N R24W SBM. Thence from ... the W boundary of Ventura Cty in the valley of the Cuyama River...beginning at a point in Sec 17 T8 R24W SBM approx. 1100 ft S of the N boundary of Sec 17, thence SE-ly along the NE bank of the Cuyama river a distance of 10 mi to a point near the center of Sec 19 T7N R23W on the S-ly bank of the Cuyama river thence E about ¾ mi to a point in the W half of Sec 20 T7N R23W, thence S through the W half of the W half of Sec 20 T7N R23W, and the W half of the W half of Sec 29 T7N R23W on the E side of Boulder Cyn, thence S on the W side of Boulder Cyn through the E half of the SE qtr of Sec 30 and the W half of Sec 32 T7N R23W, thence SW passing the great saddle rock to a point on the summit of Pine Mtn at the quarter corner between Sec 5 and 6, T6N R23W, thence S along the W side of Chorro Chiquito Cyn through Sec 6, 7, 8 and 18 T6N R23W to the valley of the Sespe River, thence crossing the Sespe River and S up the E side of Cherry Ck Cyn through Sec 19, 30, and 31 T6N R23W to the summit of Ortega Hill in Sec 31 T6N R23W, thence from the top of Ortega Hill and following along the Wheeler Ridge passing through the SW corner of Sec 32 T6N R23W, through the NE corner of Sec 1 T5N R24W, through the center of Sec 6 T5N R23W, to the SE corner of Sec 5 T6N R23W, thence S through Sections 8 and 9 T6N R23W, to a point near the ¼ corner on the S side of Sec 8 T5N R23W, to a point in the Matilja Rd near the Matilja Hot Springs in said Sec 29.... thence SE-ly with the Matilja and Meiners Rds ... to the town of Nordhoff ... thence S-ly with the San Antonio Crk Rd, the Nordhoff Rd, and the Ventura Avene to the N-ly limits of San Buenaventura." "An act to make an appropriation for changing the state road known as Emigrant Gap so as to eliminate the grade crossing over the railroad tracks near Summit Stn"
LRN 37 US 40 US 40 Reroute "for making a change in the location of the Emigrant Gap state road so as to eliminate the grade crossing of said road over the railroad track near Summit Station provided that the Southern Pacific company shall contribute not less than $3,500 for the same purpose." In 1914, the function of Maintenance was added to the Division of Engineering, supported by funds made available by a 1913 legislative act requiring motor vehicle registration. Revenue generated by these fees were to be divided between the states and counties, making it possible to develop a systematic maintenance program.